IB students Podar International School have done an excellent garden project at Acworth Leprosy Musuem, Wadala, Mumbai. The students have toiled a lot and put-in their efforts to give a beautiful gift of garden to the leprosy hospital. It took about 2 months to complete the project and students visited the site every day and made the dream project come true. The project was done under the able leadership of Dr. Vandana Lulla, Director of the School. Indian Development Foundation appreciate the wonderful social responsibility initiative of Podar students gift a garden to a leprosy hospital. IDF played its role in co-ordinating with the Podar team for garden beautification project. It was just an !dea which came true. Bank of America received IDF CSR Award for excellent support and participation in the social responsibility initiatives of IDF during 2009-10. Dr. A. R. K. Pillai, President and Dr. Narayan B. Iyer, CEO presented the CSR Award to Mr. Sanjay Barve, Asst. Vice President, Country Compliance Manager, Bank of America and Mr. Kumar Shah, Chief Operating Officer, DSP Merrill Lynch Limited (a subsidiary of Bank of America Corp). Team from Bank of America and Merrill Lynch thanked IDF for presenting the CSR Award and appreciated IDF humanitarian efforts. “There is no age bar in helping the poor and needy. What we need is a big heart to help others. I have wanted to help the lesser priviledged since I was very young and I am happy I got a very supportive platform in the form of IDF. I was impressed by the work of Dr Franklin in Bangalore and i continue to be with IDF even though i have shifted to Hyderabad now. When there was flood in AP and Karnataka, i could not sleep. 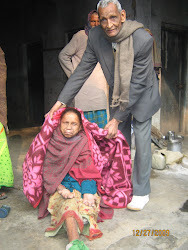 I asked my father if we can go to the flood affected places and donate clothes and help the needy. I do whatever is possible from my side and feel happy that i could understand the problems of the people,” says G R Shankersai. 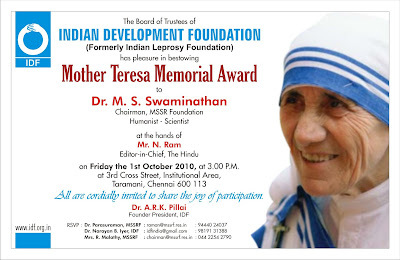 ....................... Shankersai end his conversation with me with his favourite quote by Mother Teresa — “Helping hands are better than praying lips“. Indian Development Foundation team in collaboration with Dominos Pizza Ltd., Standard Chartered Bank, Morgan Stanley, NSS Volunteers from Mumbai University, Students from Vivek College of Commerce, Goregaon (W), Atharva College of Engineering, Malad (W), Podar International School, Santacruz (W), Volunteers from various Schools/ Colleges/ NGOs/ Corporate bodies in Mumbai joined hands with Municipal Corporation and various agencies and school students in cleaning Juhu Beach during the morning hours of 23rd Sept. 10. Like every year, Indian Development Foundation (IDF) took the lead to cleanup Juhu Beach the morning after the Ganpati immersion. Mumbai's most popular festival, Ganesh Chathurthi came to an end on Wednesday. Several thousands of Ganesh idols were immersed in various beaches in Mumbai. The after effect of this festival could be seen in various beaches with piled up flowers, coconuts, plastic bags, food packets and litters left behind by the festival revellers. There were also several idols on the beach which were brought by the waves after immersion. Juhu Beach Cleanup drive received immense support from school and college student groups, NCC and NSS volunteers in Mum bai along with several NGOs and corporates lending hand to BMC in clearing the after-effects of idol immersion. We could see more volunteers turning up every year to participate in the cleanup drive and feel happy in doing their social responsibility, expressed Dr. Narayan B. Iyer, CEO, IDF. I am happy to see executives and leaders from corporate world shouldering responsibility with young students to keep our Juhu Beach clean, he added. The total effort by the volunteers from various sectors is appreciative and we could see juhu beach with sparkling yellow sand once the debris strewn is removed, Pratik Shah from Standard Chartered Bank expressed. The awareness on eco-friendly festive celebration has helped in the reduction of litters this year, he added. My team has done an excellent job by participating in the post Ganpati visarjan cleanliness drive, said Mr. Raj Shahi, Regional Manager of Dominos Pizza Ltd., who led 100 volunteers from his Mumbai unit. We have been participating with IDF in such cleanliness drive as it is our social responsibility to protect our beach and keep it clean, said Yogesh Sood from Dominos. The joint efforts of volunteers made it easier for the municipality to clear tonnes of debris from the juhu beach. It is our duty to keep our beaches clean and ban usage of plastic items, NSS volunteers, Rajnikant and Narayan Acharya expressed. Samarpita Mukherjee-Sharma discovers an Indian teenager who has been helping the society from a tender age. Think of your 8-9 year old children. What do they do all day? School, play, television – what else? Anything else? What if one day your child comes to you and says that he/she wants to help the society; wants to be a change maker? How would you react if your child said he wants to celebrate his birthday with the street children? Would you support your child in such an endeavor or say the expected, “Study now, do all this later.”? Meet 13-year-old F.A. 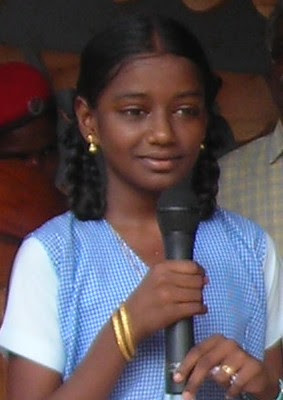 Shiloh Jessie Francisca, a IXth standard student of Rani Seethai Achi Higher Secondary School, Annamalainagar, Cuddalore District, Tamilnadu. “Educating a child is not only for the better future of the child but also for the better formation of the society is the golden motto of our Dr Pillai from IDF. On seeing his involvement at the age of 83, with such a forceful team, I am inspired to do more social work for IDF. It’s my passion to serve people in distress,” quotes Shiloh. 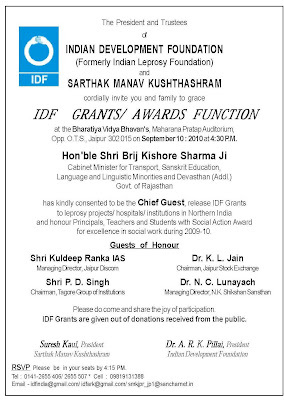 IDF Thank Schools in Udaipur (Rajasthan) for extending support for leprosy/ TB and education programmes. 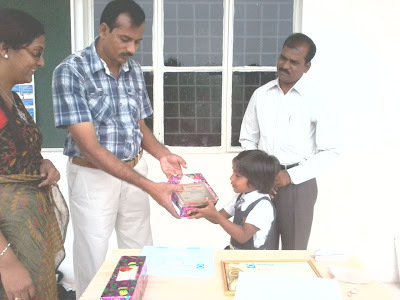 St. Gregorios School, Udaipur supports IDF work. 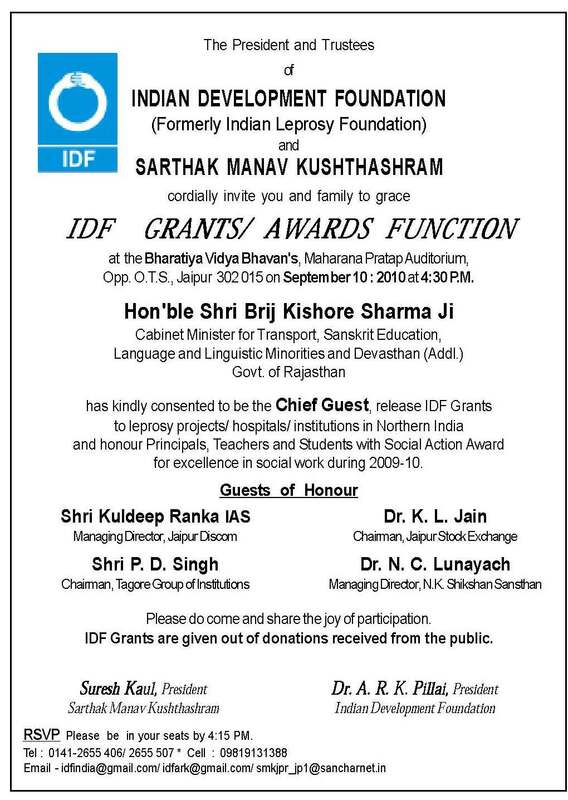 Congratulations to the Schools in Bhilwara for receiving IDF Award of Excellence for supporting leprosy/ TB and education programmes of IDF during 2009-10. Bhavan Vidyalaya, Panckula, Haryana supports IDF's leprosy/ TB and social programmes. Mrs. Shashi Banerjee, Principal of the school appreciated the work of IDF and she exhorted the students to support social causes and participate in IDF's nation building activities. 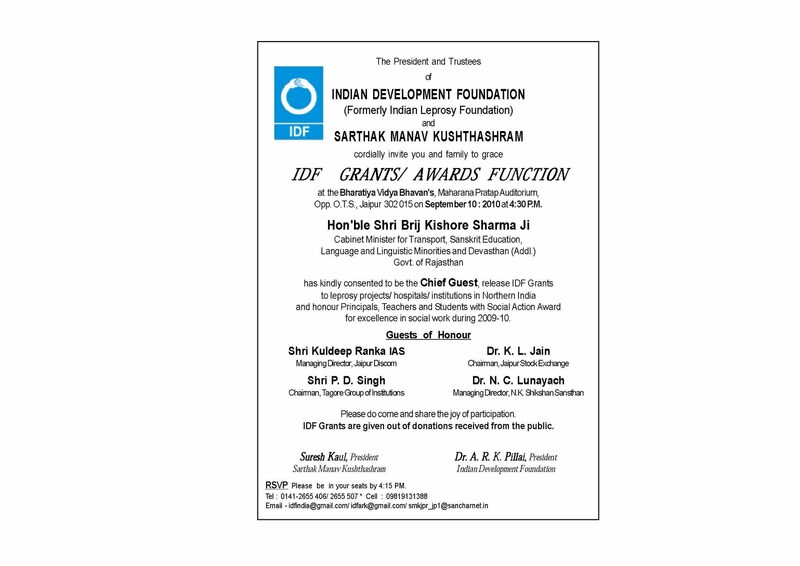 Kinshuk Nanda, Anmol Mendiratta, Meghna Bhardawaj, Aman Jain and Nitish Goyal received IDF medals and certificates for excellent social responsibility. They all wished to be IDF young social ambassadors and spread the message of goodness. IDF Rolling Trophy for excellent service was also presented to the Bhavanites by Dr. Pillai and Dr. Narayan. Mr. M. Boyaz, Principal, St. Gregorios School, Dwarka, New Delhi is flanked by Dr. Pillai and Dr. Narayan during IDF team's visit to the school on 03-09-2010. Rev. Fr. Ninan Phillip, Chairman, St. Gregorios School, Chandigarh is flanked by Dr. Pillai and Dr. Narayan during IDF team's visit to the school on 06-09-2010. IDF salutes St. Gregorious Schoolteams for their constant support to leprosy/ TB programmes. Bharatiya Vidya Bhavan's D.R.A. 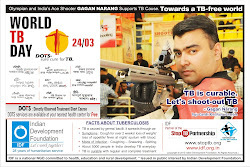 Bhavan Vidyalaya, Chandigarh supports IDF's leprosy/ TB programmes. Mrs. Vineeta Arora, Principal, Mrs. Inderpreet Kaur, Vice Principal and Mrs. Sheetal Sharma, Co-ordinator appreciated the work of IDF and presented the contributions voluntarily mobilised by the students. Dr. Pillai and Dr. Narayan thanked the Bhavanites for their kind and continued support. Interactors Varnika Sharma, President, Shreya Pragya, Director-Vocational Services, Tanisha Garg, Secretary and Kanksha Malhotra, Treasurer took keen interest in promoting IDF work among the students. The team look forward to more service oriented programmes in future. Dr. A.R.K.Pillai, President of Indian Development Foundation presented IDF Award of Excellence to Dr. Hepesh Shepherd, Director, Ingraham Institute for excellent participation and support extended for the social responsibility initiatives of IDF. 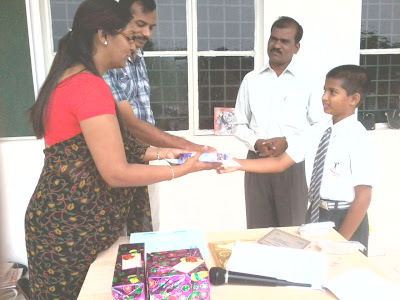 The felicitation event co-incided with Teachers' Day celebrations. Dr. Pillai and Dr. Narayan congratulated Dr. Shepherd and all the teaching faculties for lending support to leprosy/ TB and education programmes of IDF. Dr. Mrs. M.R. La'Verne, Retd. Reader, Deptt. of Physical Education, Lucknow Christian P.G. College, Lucknow was the Chief Guest for the function. IDF Social Action Awards were presented to Mrs. T. Pershad, Headmistress and Mrs. O. F. Bacon, Teacher from Ingraham Institute English School - Mrs. Arpana Ruth, Principal and Mr. Naresh Kumar, Teacher from Ingraham Institute English School, Ghaziabad - Mrs. Mohini Sampson, Principal and Mrs. V. Singh, Teacher from Ingraham English Medium School. Mr. Anurag Kishor, Co-ordinator, Ingraham Bal Gurukul was also felicitated at the function. 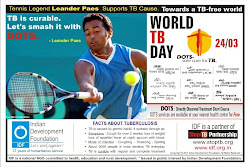 Gurukul Concept School, Talur Road, Bellary, Karnataka supports IDF's leprosy/ TB programmes. Mr. H. Gurumurthy, Sr. Development Executive, IDF presented IDF certificate of Appreciation to Mr. Govind, Director and Mrs. Sunitha, Principal of the School for excellent social responsibility initiatives. Mr. Vijay Nurani and his daughter Ms. Harini Nurani from Michigan have been inducted as IDF Social Ambassadors for USA. Harini a student of Troy High School in Michigan has great interest in arts, reading and sports. Harini did an social internship of about two weeks with Indian Development Foundation during her visit in India. She also visited Vimala Centre, a leprosy home in Mumbai and interacted with the inmates and children. 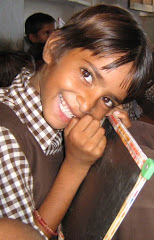 Harini also made illustrations on IDF Bal Gurukul which will motivate children to go to school. Mr. Vijay and Ms. Harini will spread the message of goodness and help IDF's social responsibility programmes.